Twenty-four-year-old aspiring writer Brian Bloom (Anton Yelchin) embarks on a relationship with thirty-three-year-old Arielle (Bérénice Marlohe), the only catch is she is married with two young children and they can only meet between the hours of 5 to 7 each evening. 5 to 7 is a sweet romantic film that is elevated by the performances and chemistry between the leads. Brian could easily be an annoying would-be writer, putting off going to law school in order to “follow his dream”, but Yelchin has this effortless charm that makes Brian an idealistic romantic. Arielle is the more complex and interesting of the two of them, she’s up front with what she wants and the rules of their relationship. Seeing Brian and Arielle’s relationship grow is surprisingly beautiful. Glenn Close and Frank Langella are Brain’s parents and while they aren’t in the film much, when they do make an appearance, they are hilarious, Langella especially. Their reactions to Brian and Arielle’s relationship is very realistic as they care about their son and don’t want him to get hurt, but can also see that he’s happy. The directing, cinematography and music is all top notch and the film shows New York City at its most picturesque. 5 to 7 is unexpectedly lovely. The way the story unfolds as these two people fall more and more in love is both touching and wistful. 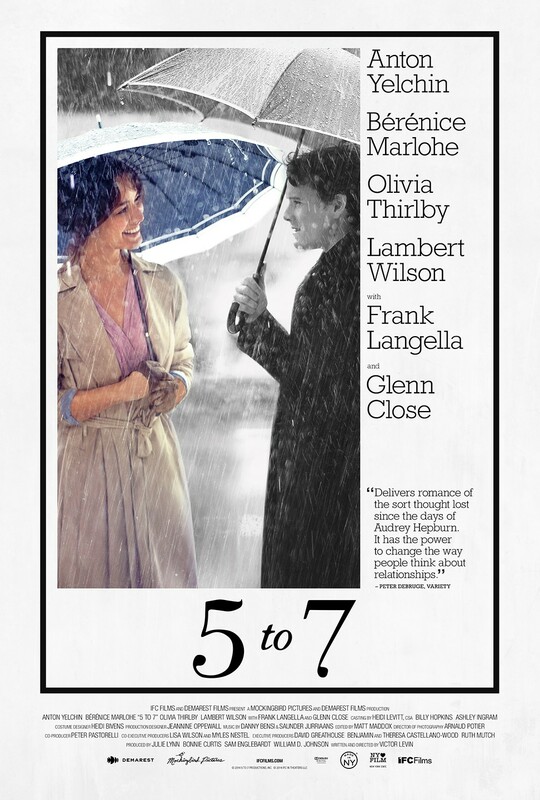 5 to 7 is an intriguing take on love, and how there can be so many different types of it and you can encounter it when you least expect it. 4/5.